Hello, Hermas. How are things in Ouagadougou? I’m fighting with the heat. Well it’s six o’clock and dark is just coming, so now it is a little bit not hot. But to you it is hot. If you were here at around 12 o’clock I’m sure that you would melt. In all my family are what we call griots, people who are singing and praising, giving praises to very important people in the village. My family used to do such a thing. Since when I was born, all my family are Christians, but this mark was still on me. I could still see some people singing and praising each other. I grew up with that. At around 12 years I said I will become a singer. So I started training myself. 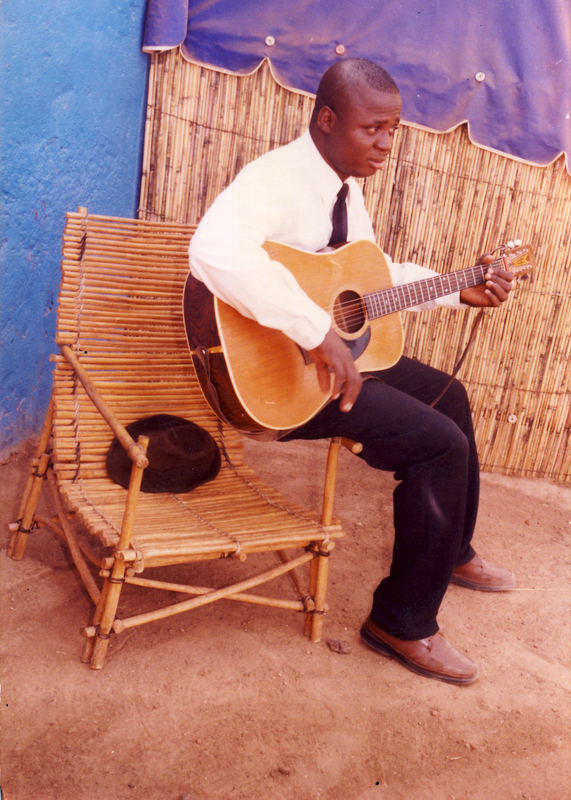 And in 1999 I moved from Leo to Ouagadougou and I continued in the music. When I was 18 years old I started to do music really well, doing my own songs. And in 2000 I met Jonathan [Dueck] and his wife. OK, I have spoken a lot. Now you must ask me another question. So are you a still griot? Are there griots still around? Yes, there are still griots. But with the religion, they are stopped. They are nothing like they used to be in the past. In the past we had our griots and they were using their abilities to sing praises to the idols. So now they are not singing in that same way. Musically, which artists are your influences? We have some musicians in Burkina that are really loved much, but I don’t use the style they are using to play their instruments. I can say [Ivorian reggae star] Alpha Blondy is the first one. [Late South African reggae star] Lucky Dube is another one. And we also have some old musicians that are really—I liked the way they play. Pepe Kalle. You know how he dances and how he sings? Yes, I know Sam Mangwana. We have so many of them here in Burkina Faso. Wow. That is a great question. I really cannot figure it out. Because each year we have something we call the Musicians' Festival. And we can see on the television that they have more than 80 musicians registered. I’m not sure because you have to have two albums for sale before you register. So maybe in the coming year I will be able to. Are there many music venues around Ouagadougou? We have so many places. Sometimes we don’t even need to go to a very remarkable place. Even you can just play on the corner. But if you want to organize a very big concert and we have places you can go to. And if you are a very, very well-known musician you can hire the stadium. Alpha Blondie. Lucky Dube. So do people do in Burkina Faso like music? Yes, they do. But in the past, Burkinabé people, they like music but they are not trying to play music by themselves. They were buying cassettes from Abidjan. We have more than 6 million people in Abidjan. So going and coming back they would just buy some tapes from there, and they don’t care about other musicians here in Burkina Faso. The new music from Burkina Faso is there in Abidjan, and we also have theirs here. So is the music from Ivory Coast and Mali and Niger and Mali different from Burkina Faso’s music? In Burkina Faso you’ll see that people are saying we are singing warba. Most people in Burkina Faso are Mossi people. And Mossi people used to dance warba. But if you go to Mali, it’s madang. And now in Abidjan, it’s very mixed. I can’t tell you what kind of music they’re dancing to there because they have a very mixed population. You will see Ghanaians. You will see Burkinabé. You will see Malians. You’ll see people from every country living there. They have everything: reggae, madang, and since they have more than 6 million Burkinabé there, if you bring a cassette, they can start dancing warba. Are those dance styles or music styles? They are dance styles, but all styles of dance are coming with their own style of music. I want to be a very well-known musician. And I want to have my own team and my own studio. If you have your own studio is very easy for you to perform songs. Very easy! Because you’ll have all the time to mix and remix them to review all that you have been doing before you let it go out. And I want to move around the world. Do you want to fill the stadium like Alpha Blondy? Do you have any concerts coming up soon? No, not here in Ouagadougou. Not yet. My plan is that I’m looking to go to the U.S., where I will be making my second album. But now it is the period when people are going on vacation, so at the airport where I am working, we have so many flights. So I don’t have any time to organize anything during this period. Maybe from October to February, something can be organized. Now I’m working seven days a week. So that leads me to being not able to accomplish something of my desires. No, I don’t have any. I am free. I’m open. I’ll put the word out. That is all of my questions. Was there anything else you wanted to say? Yes. I had another thing to let you know: Out of 36 brothers and sisters I am the last born. My father was married to six wives. I’m the last one of the family. I was born when my father was nearly 80 years. Some people say he was 90 years. So you still have time to have children. Image by Inoussa Nadie, courtesy of Asthmatic Kitty Records.